Not to be confused with the Palace Museum in Beijing, People's Republic of China. The National Palace Museum,[note 1] located in Taipei and Taibao, Chiayi County, Taiwan, has a permanent collection of nearly 700,000 pieces of ancient Chinese imperial artifacts and artworks, making it one of the largest of its type in the world. The collection encompasses 8,000 years of history of Chinese art from the Neolithic age to the modern. Most of the collection are high quality pieces collected by China's emperors. The National Palace Museum shares its roots with the Palace Museum in the Forbidden City, whose extensive collection of artwork and artifacts were built upon the imperial collections of the Ming and Qing dynasties. The National Palace Museum was originally established as the Palace Museum in the Forbidden City on 10 October 1925, shortly after the expulsion of Puyi, the last emperor of China, from the Forbidden City by warlord Feng Yuxiang. The articles in the museum consisted of the valuables of the former Imperial family. In 1931, shortly after the Mukden Incident Generalissimo Chiang Kai-shek's Nationalist Government ordered the museum to make preparations to evacuate its most valuable pieces out of the city to prevent them from falling into the hands of the Imperial Japanese Army. As a result, from 6 February to 15 May 1933, the Palace Museum's 13,491 crates and 6,066 crates of objects from the Exhibition Office of Ancient Artifacts, the Summer Palace and the Imperial Hanlin Academy were moved in five groups to Shanghai. In 1936, the collection was moved to Nanking after the construction of the storage in the Taoist monastery Chaotian Palace was complete. As the Imperial Japanese Army advanced farther inland during the Second Sino-Japanese War, which merged into the greater conflict of World War II, the collection was moved westward via three routes to several places including Anshun and Leshan until the surrender of Japan in 1945. In 1947, it was shipped back to the Nanjing warehouse. The Chinese Civil War resumed following the surrender of the Japanese, ultimately resulting in Generalissimo Chiang Kai-shek's decision to evacuate the arts to Taiwan, which had been handed over to the ROC in 1945. When the fighting worsened in 1948 between the Communist and Nationalist armies, the National Beijing Palace Museum and other five institutions made the decision to send some of the most prized items to Taiwan. Hang Li-wu, later director of the museum, supervised the transport of some of the collection in three groups from Nanking to the harbor in Keelung, Taiwan between December 1948 and February 1949. By the time the items arrived in Taiwan, the Communist army had already seized control of the National Beijing Palace Museum collection so not all of the collection could be sent to Taiwan. A total of 2,972 crates of artifacts from the Forbidden City moved to Taiwan only accounted for 22% of the crates originally transported south, although the pieces represented some of the very best of the collection. a.^ In the third shipment, 728 crates from the National Beijing Palace Museum and 28 crates from the National Central Library were left in Nanjing due to limited space aboard. The fourth shipment was halted by then acting president Li Zongren. The collection from the National Beijing Palace Museum, the Preparatory Office of the National Central Museum, the National Central Library, and the National Beiping Library was stored in a railway warehouse in Yangmei following transport across the Taiwan Strait and was later moved to the storage in cane sugar mill near Taichung. In 1949, the Executive Yuan created the Joint Managerial Office, for the National Beijing Palace Museum, the Preparatory Office of the National Central Museum and the National Central Library to oversee the organization of the collection. For security reasons, the Joint Managerial Office chose the mountain village of Beigou, located in Wufeng, Taichung as the new storage site for the collection in the same year. In the following year, the collection stored in cane sugar mill was transported to the new site in Beigou. With the National Central Library's reinstatement in 1955, the collection from the National Beijing Library was simultaneously incorporated into the National Central Library. The Joint Managerial Office of the National Beijing Palace Museum and the Preparatory Office of the National Central Museum stayed in Beigou for another ten years. During the decade, the Office obtained a grant from the Asia Foundation to construct a small-scale exhibition hall in the spring of 1956. The exhibition hall, opened in March 1957, was divided into four galleries in which it was possible to exhibit more than 200 items. Paifang of the Northern Branch of National Palace Museum. In the autumn of 1960, the Office received a grant of NT$32 million from AID. The Republic of China (ROC) government also contributed more than NT$30 million to establish a special fund for the construction of a museum in the Taipei suburb of Waishuanxi. The construction of the museum in Waishuanxi was completed in August 1965. The new museum site was christened the "Chung-Shan Museum" in honor of the founding father of the ROC, Sun Yat-sen, and first opened to the public on the centenary of Sun Yat-sen's birthday. Since then, the museum in Taipei has managed, conserved and exhibited the collections of the National Beiping Palace Museum and the Preparatory Office of the National Central Museum. The National Palace Museum in the 1970s. Two wings were added to the main building after the second phase of the museum's expansion. During the 1960s and 1970s, the National Palace Museum was used by the Kuomintang to support its claim that the Republic of China was the sole legitimate government of all China, in that it was the sole preserver of traditional Chinese culture amid social change and the Cultural Revolution in mainland China, and tended to emphasize Chinese nationalism. The People's Republic of China (PRC) government has long said that the collection was stolen and that it legitimately belongs in China, but Taiwan has defended its collection as a necessary act to protect the pieces from destruction, especially during the Cultural Revolution. However, relations regarding this treasure have warmed in recent years and the Palace Museum in Beijing has agreed to lend relics to the National Palace Museum for exhibitions since 2009. The Palace Museum curator Zheng Xinmiao has said that the artifacts in both mainland and Taiwan museums are "China's cultural heritage jointly owned by people across the Taiwan Strait." A number of Chinese artifacts dating from the Tang dynasty and Song dynasty, some of which had been owned by Emperor Zhenzong, were excavated and then came into the hands of the Kuomintang General Ma Hongkui, who refused to publicize the findings. Among the artifacts were a white marble tablet from the Tang Dynasty, gold nails, and bands made out of metal. It was not until after Ma died that his wife went to Taiwan in 1971 from America to bring the artifacts to Chiang Kai-shek, who turned them over to the National Palace Museum. Main Hall of the Northern Branch of National Palace Museum. 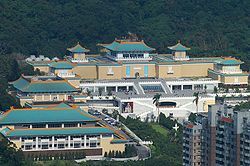 The National Palace Museum's main building in Taipei was designed by Huang Baoyu and constructed from March 1964 to August 1965. Due to the insufficient space to put on display over 600,000 artifacts, the museum underwent expansions in 1967, 1970, 1984 and 1996. In 2002, the museum underwent a major NT$21 million renovation revamping the museum to make it more spacious and modern. The renovation closed about two-thirds of the museum section and the museum officially reopened in February 2007. Permanent exhibitions of painting and calligraphy are rotated once every three months. Approximately 3,000 pieces of the museum's collection can be viewed at a given time. Although brief, these exhibitions are extremely popular. In 2014, the museum organized the top three best-attended exhibitions worldwide, including paintings and calligraphic works by Tang Yin, as well as depictions of the Qing dynasty's Qianlong Emperor reinterpreted by contemporary artists. The Southern Branch of the National Palace Museum is located in Taibao, Chiayi County, Taiwan and set on 70 hectares (700,000 m2) of land. There is also a lake and Asian style garden on the grounds. Planning for the southern branch began in 2000. The building was to be designed by architect Antoine Predock and began construction in 2005. However, due to serious construction delays and disputes between the contractors and the museum, the firm pulled out in 2008. Museum director Chou Kung-shin stated in August 2010 that new architects Kris Yao for the project would commence, with construction expected to be completed in 2015. The project cost NT$7.9 billion (US$268 million) and spread over 70 hectares (700,000 m2). The museum itself, 9,000 square meters in total, was designed by the Taiwan-based firm Artech Inc. and is both earthquake resistant and flood resistant. Complete inventory inspection has been taken three times in 1951–1954, 1989–1991 and 2008–2012 since the museum started to bring collections to Taiwan in 1948. According to official report, the museum house Chinese calligraphy, porcelain, bronzes, paintings, jades and many other artifacts, with 22% (2,972 out of 13,491 crates) of the boxes originally transported south from the Forbidden City. Other additions include transfers from other institutions, donations, and purchases made by the museum. A lot of these artifacts were brought by Chiang Kai-shek before his Kuomintang forces fled the mainland in 1949. The museum has accumulated nearly 700,000 artifacts of significant historical or artistic values. With a collection of this size, only 1% of the collection is exhibited at any given time. The rest of the collection is stored in temperature controlled vaults. The museum houses several treasured items that are the pride of their collection and famous worldwide. The antiquities in the National Palace Museum span over thousands of years with a variety of genres. The Warming Bowl in the Shape of a Flower with Light Bluish-green Glaze, Ru ware, c. 1086 - c. 1106. The Narcissus Basin with Light Bluish-green Glaze, Ru ware, c. 1086 - c. 1106. The Jadeite Cabbage, 19th century. The Meat-shaped Stone, 17th century. Among the collections of bronzes, Zong Zhou Zhong (Bell of Zhou), commissioned by King Li of Zhou, is the most important musical instrument cast under his royal decree. Mao Gong Ding (Cauldron of Duke of Mao) of the late Western Zhou Dynasty (1046–771 BCE) carries the longest Chinese bronze inscriptions so far extent. With 21 pieces out of fewer than 80 surviving, the museum has the world's largest collection of Ru ware, one of the rarest Chinese ceramics, made exclusively for the court and one of the Five Great Kilns of the Song Dynasty (960–1279), along with Ding porcelain, Jun ware, Guan and Ge; the museum has major collections of all of these. Those from the official kilns of the Ming (1368–1644) and Qing (1644–1912) dynasties, such as the doucai porcelains of the Chenghua reign in the Ming Dynasty and painted enamel porcelains from the early Qing, are also of excellent quality. One of the most popular pieces of jade carvings in the museum is the Jadeite Cabbage. It's a piece of jadeite carved into the shape of a cabbage head, and with a large and a small grasshopper camouflaged in the leaves. The ruffled semi-translucent leaves attached is due to the masterful combination of various natural color of the jade to recreate the color variations of a real cabbage. The Meat-shaped Stone is often exhibited together with the Jadeite Cabbage. A piece of jasper, a form of agate, the strata of which are cleverly used to create a likeness of a piece of pork cooked in soy sauce. The dyed and textured surface makes the layers of skin, lean meat, and fat materialized incredibly lifelike. Other various carvings of materials such as bamboo, wood, ivory, rhinoceros horn, and fruit pits are exhibited. The Carved Olive-stone Boat is a tiny boat carved from an olive stone. The incredibly fully equipped skilled piece is carved with a covered deck and moveable windows. The interior has chairs, dishes on a table and eight figures representing the characters of Su Shih's Latter Ode on the Red Cliff. The bottom is carved in minute character the entire 300+ character text with the date and the artist's name. The paintings in the National Palace Museum date from the Tang Dynasty (618–907) to the modern era. The collection covers over one thousand years of Chinese painting, and encompasses a wide range of genres, including landscape, flower and bird, figure painting, boundary painting, etc. Among the most popular paintings in the collection is the Qing Palace Version of Along the River During the Qingming Festival by five Qing dynasty court painters (Chen Mu, Sun Hu, Jin Kun, Dai Hong and Cheng Zhidao). Dwelling in the Fuchun Mountains (Wu-yung version) by Huang Gongwang of Yuan Dynasty is one of the rarest and most dramatic works. Walking on a Mountain Path in Spring is another significant work. The museum has a vast collection of calligraphy works from the hands of major calligraphers, scholars and important courtiers in history. The calligraphy works date from the Jin (265–420) and Tang (618–907) dynasties, with a variety of styles. Rare books in the National Palace Museum range from the Song (960–1279) and Yuan (1271–1368) dynasties to the Ming (1368–1644) and Qing (1644–1912) dynasties, amounting to over 200,000 volumes. Yongle Encyclopedia and Siku Quanshu (Complete Library of the Four Treasuries) are among the examples. Historical documents in the museum include Jiu Manzhou Dang, a set of Manchu archives that are the sourcebook of Manwen Laodang and a primary source of early Manchu history. Other official documents such as the court archives are available for research in the history of the Qing Dynasty. The Travelers Among Mountains and Streams, by Fan Kuan, c. 1000. The Early Spring, by Guo Xi, 1072. The Wind in Pines Among a Myriad Valleys, by Li Tang, 1124. The Lofty Mt.Lu, by Shen Zhou, 1467. The Immortal in Splashed Ink, by Liang Kai, c. 1200. The Walking on a Mountain Path in Spring, by Ma Yuan, 13th century. A palace concert, c. 836 - c. 907. The Literary Gathering, by Emperor Huizong of Song, 12th century. The Listening Quietly to Soughing Pines, by Ma Lin, 13th century. The Homeward Oxherds in Wind and Rain, by Li Di, 12th century. The Magpies and Hare, by Cui Bai, 1061. The Herd of Deer in a Maple Grove, c. 1031-48. The One Hundred Horses: A painting done in 1728 by Giuseppe Castiglione by implementing a mixture of western artistic skills and utilizing eastern materials to realize a sense of realism to this native theme. Due to fears that the artifacts may be impounded and be claimed by China due to the controversial political status of Taiwan, the museum does not conduct exhibitions in mainland China. Since the museum's 1965 establishment in Taipei, the National Palace Museum has only made five large overseas exhibitions in countries which have passed laws to prevent judicial seizure of the treasures. The past five overseas events were to the United States in 1996, France in 1998, Germany in 2003, Austria in 2008 and Japan in 2014. 1935: "London International Exhibition of Chinese Art" at the Royal Academy of Arts, London. 1940: "Chinese Art Exhibition" in Moscow, Leningrad. 1961: "Ancient Chinese Art Exhibition" National Gallery of Art in Washington, D.C., New York Metropolitan Museum of Art, Boston Museum of Fine Arts, Museum of Contemporary Art, Chicago, the de Young Museum. 1973: "China Exhibition" in Seoul, South Korea. 1991: "On the Occasion of 1492: the art of the Age of Exploration" at the Washington National Gallery of Art. 1996: "Splendors of Imperial China" at the Metropolitan Museum of Art, Museum of Contemporary Art, Chicago, Asian Art Museum of San Francisco, Washington, D.C. National Gallery of Art exhibition. 1998: "Empire of Memory" at the Grand Palais in Paris exhibition. 1999: National Palace Museum exhibition in Central America. 2000: "Taoism and Chinese art," Museum of Contemporary Art, Chicago and Asian Art Museum of San Francisco. 2003: "Treasures of the Son of Heaven," the old museum in Berlin, Bonn, Federal Art Gallery touring exhibition. 2005: "Museum of World Culture Expo Korea" in Korea. 2005: "The Mongolian Empire – Genghis Khan and his generation" exhibition at the Museum of Anthropology in Munich, Germany. 2006: "magnificent years of the Qing court (1662–1795)" exhibition at the Guimet Museum, France. 2007: "Shanghai – Modern Art" exhibition in Japan. 2008: "Imperial Treasures" in the Kunsthistorisches Museum Vienna exhibition. 2014: "The Treasured Masterpieces from the National Palace Museum, Taipei" in the Tokyo National Museum and Kyushu National Museum. Housed within the compound of the National Palace Museum, this classical Chinese Song and Ming style garden covers 1.88 hectares (18,800 m2). It incorporates the principles of such diverse fields as feng shui, Chinese architecture, water management, landscape design, and Chinese folklore and metaphor. It contains numerous ponds, waterworks, and wooden Chinese pavilions. It was completed and opened in 1985. There is also another Chinese Style Garden nearby called the Shuangxi Park and Chinese Garden. The National Palace Museum also maintains the residence of renowned Chinese painter Chang Dai-chien. The residence, known as the Chang Dai-chien Residence or the Abode of Maya, was constructed in 1976 and completed in 1978. It is a two-story Siheyuan building with Chinese-style gardens occupying approximately 1,911 m². After Chang's death in 1983, the house and gardens were donated to the National Palace Museum and turned into a museum and memorial. The Grand Palace Museum Project, officially launched in 2011, is a plan to expand the exhibition area in Taipei and improve the environment. The total budget for renovation should be around NT$10 to 12 billion. ^ Distinguished from the Palace Museum in Beijing. In common usage in Chinese, as the "Taipei Former Palace" (臺北故宮), while the Palace Museum is known as the "Beijing Former Palace" (北京故宮). ^ a b "List of Categories in the Collection". National Palace Museum. Retrieved 31 January 2018. ^ a b 國立故宮博物院: 106年度參觀人數統計 (PDF). National Palace Museum. Retrieved 23 March 2018. ^ Peter Enav (12 May 2009). "National art collection evokes hard history". The China Post. AP. Retrieved 16 June 2012. ^ a b c "Chronology of Events". National Palace Museum. Retrieved 4 June 2008. ^ a b c "Tradition & Continuity". National Palace Museum. Retrieved 17 June 2012. ^ "The National Palace Museum: Timeline of the NPM". National Palace Museum. Retrieved 20 December 2010. ^ "China to lend treasures to Taiwan". BBC. 16 February 2009. Retrieved 16 June 2012. ^ Mark McDonald (2 March 2009). "Top bid on disputed Yves Saint Laurent bronzes was a protest from China". The New York Times. ^ China archaeology and art digest, Volume 3, Issue 4. Art Text (HK) Ltd. 2000. p. 354. Retrieved 28 November 2010. ^ a b "Renovation". National Palace Museum. Archived from the original on 1 December 2012. Retrieved 21 September 2012. ^ 正館、行政大樓、圖書文獻大樓工程 [The Construction of the Main Building, the Administration Building and the Library Building] (PDF) (in Chinese). National Palace Museum. 11 October 2010. Archived from the original (PDF) on 27 October 2012. Retrieved 21 September 2012. ^ a b Gluck, Caroline (7 February 2007). "Taiwan's museum of treasures". BBC News. Retrieved 30 March 2010. ^ Bradsher, Keith (28 December 2006). "Rare Glimpses of China's Long-Hidden Treasures". The New York Times. ^ Quartly, Jules (4 February 2007). "National Palace Museum is born again". Taipei Times. ^ "Visitor's Guide". National Palace Museum. Retrieved 21 September 2012. ^ Murakami, Takio (23 October 2011). "Taiwanese Palace Museum may increase floor area 7-fold". The Asahi Shimbun. Archived from the original on 13 November 2012. ^ "Visitor figures 2014: the world goes dotty over Yayoi Kusama". The Art Newspaper. 2 April 2015. Retrieved 10 April 2015. ^ a b "Taiwan's National Palace Museum opens new branch after 15-year wait". Straits Times. Agence France Presse. 28 December 2015. Archived from the original on 29 December 2015. Retrieved 5 January 2016 – via Yomiuri Shimbun and Gulf News. ^ "U.S. architectural firm quits NPM southern branch project". The China Post. 28 November 2008. Retrieved 20 December 2010. ^ "National Palace Museum chief upsets lawmakers". Taipei Times. 11 November 2010. Retrieved 20 December 2010. ^ a b "National Palace Museum in Taiwan unveils designs of Southern Branch". World Interior Design Network. 28 March 2011. Archived from the original on 9 October 2011. Retrieved 9 April 2011. ^ "Inventories of the Collection". National Palace Museum. Retrieved 17 June 2012. ^ "Collections: Antiquities (National Palace Museum)". Taiwan Academy. Retrieved 25 September 2012. ^ "The Bell and Cauldron Inscriptions–A Feast of Chinese Characters: the Origin and Development". National Palace Museum. Retrieved 25 September 2012. ^ "Northern Song Ru Ware Recent Archaeological Findings". Asian Art Newspaper. 3 March 2012. Archived from the original on 5 November 2012. ^ "Grand View: Ju Ware from the Northern Sung Dynasty". National Palace Museum. Retrieved 25 September 2012. ^ "The Magic of Kneaded Clay: A History of Chinese Ceramics". National Palace Museum. Retrieved 25 September 2012. ^ a b "Jadeite Cabbage is Moving to a New Gallery!". National Palace Museum. Retrieved 4 June 2008. ^ "Jadeite Cabbage with Insects". National Palace Museum. Retrieved 4 June 2008. ^ "Meat-shaped Stone". National Palace Museum. Retrieved 4 June 2008. ^ "Uncanny Ingenuity and Celestial Feats – The Carvings of Ming and Qing Dynasties". National Palace Museum. Retrieved 25 September 2012. ^ "Carved Olive-stone Boat". National Palace Museum. Retrieved 4 June 2008. ^ "Collections: Painting and Calligraphy (National Palace Museum)". Taiwan Academy. Retrieved 25 September 2012. ^ "Along the River During the Ch'ing-ming Festival". National Palace Museum. Archived from the original on 28 October 2012. Retrieved 25 September 2012. ^ "Dwelling in the Fu-ch'un Mountains (Wu-yung Version)". National Palace Museum. Retrieved 25 September 2012. ^ "Rare Books (National Palace Museum)". Taiwan e-Learning and Digital Archives Program. Retrieved 25 September 2012. ^ "Collections: Rare Books (National Palace Museum)". Taiwan Academy. Retrieved 25 September 2012. ^ "Vast Documents of the Yung-lo Era". National Palace Museum. Retrieved 25 September 2012. ^ "Complete Library of the Four Treasuries". National Palace Museum. Retrieved 25 September 2012. ^ "Archives in Old Manchu". National Palace Museum. Retrieved 25 September 2012. ^ "One Hundred Horses". National Palace Museum. Retrieved 4 June 2008. ^ "New Japan law opens way for exhibits". The China Post. Central News Agency. 26 March 2011. ^ "Taiwan gives green light to museum exhibitions in Japan". The Japan Times. Kyodo News. 23 June 2014. ^ "The Treasured Masterpieces from the National Palace Museum, Taipei". National Palace Museum. Retrieved 18 January 2015. ^ "Zhishan Garden - Introduction". National Palace Museum. Retrieved 17 June 2012. ^ "Chang Dai-chien Residence". National Palace Museum. Retrieved 16 June 2012. ^ "The National Palace Museum Annual Report 2011" (PDF). National Palace Museum. Retrieved 16 June 2012. Wikimedia Commons has media related to National Palace Museum.